On my way from Missoula, MT to Stanley, ID I made a quick stop at Big Hole National Battlefield in southwest Montana very close to the Idaho border. This park commemorates the location of the largest battle during the five month long Nez Perce War in 1877 between the U.S. Army and the Nez Perce people. The war was part of the United States efforts to relocate Indians to reservations, which the Nez Perce refused to do until they surrendered in October 1877. 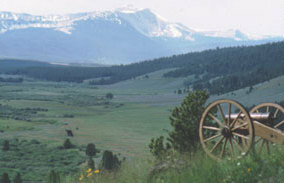 During the battle of the Big Hole 80-90 natives were killed during the two day battle on August 9-10. There is a small visitor center at the battlefield as well as a few miles of trails around important sites. Somehow I failed to take any pictures during my visit.